Each day is harder than the previous one for the mushers brave enough to take on the challenge of the Yukon Quest 1,000 Mile International Sled Dog Race. It's a reality of running the long-distance race from Fairbanks to Whitehorse, Yukon. Between the freezing conditions, the long stretch of trail and a continuous lack of sleep, it's hard to imagine teams could feel stronger as the race goes on. 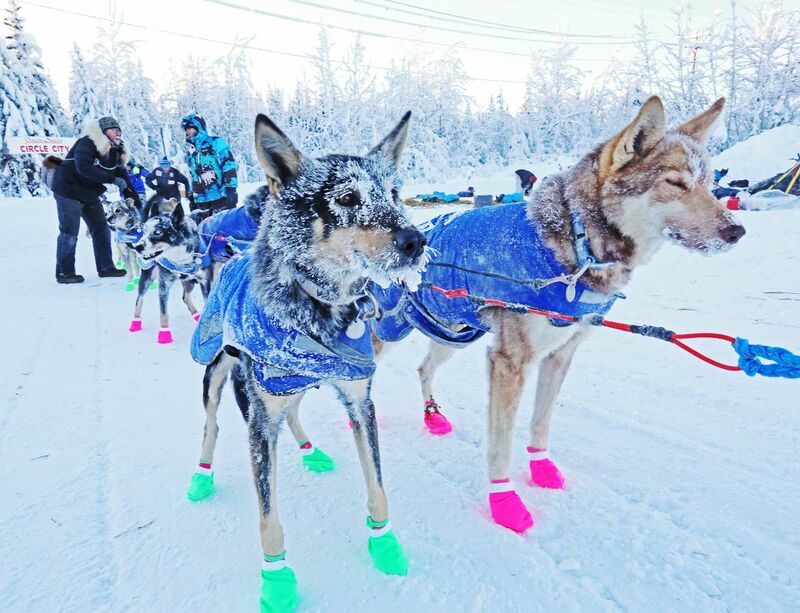 After conquering Rosebud and Eagle summits Sunday, most mushers spent Monday preparing themselves and their dogs for the 160-mile stretch from Circle to Eagle, the fifth of nine checkpoints teams will encounter before arriving at the finish line in Whitehorse. "I'll probably be out there for at least 24 hours," said Tim Pappas, a rookie from 17th Dog in Willow. "Typically I have one food-drop bag or two at each checkpoint. Here (Circle), I have five. That's just a lot more food for the dogs and myself. Some of it won't go, but there's also a lot more supplies and extra booties to prepare." As of 6 p.m. Tuesday, three of the race's 21 remaining mushers had reached Eagle, including race leader Allen Moore, who made the trip from Circle in 28 hours. Moore, a Two Rivers musher who won the Quest in 2013 and 2014, arrived with a team of 14 dogs at 11:10 a.m. Tuesday. He left at 4:40 p.m.
Paige Drobney of Ester reached Eagle at 2:37 p.m., and defending champion Matt Hall of Two Rivers got there at 5:20 p.m.
Aside from figuring out what supplies to bring on the stretch from Circle to Eagle — the race's longest run between checkpoints — teams also need to establish a game plan that will help them pull into Eagle with a happy and healthy team of dogs. Deciphering a strategy can become tricky as more and more teams begin to drop dogs because of injuries. But even though some might think having fewer dogs is an obstacle, some, like rookie Nathaniel Hamlyn from Step Up Kennels in Whitehorse, feel comfortable running a smaller team. "I'm not too worried. I think the team that I've got now can handle it," said Hamlyn, who is fielding a team of eight dogs after dropping four with shoulder injuries sustained on the trek over Rosebud. "I normally run small teams anyway, so it hasn't made a huge difference. There's a little less morale with less dogs, but I can go down to six and keep going if I need to." Regardless of the size of the team, each musher needs to find the best recipe for success. Most stop at Slaven’s Roadhouse, an isolated musher’s cabin 60 miles outside the Circle checkpoint. After that is the Mike Sager's Trout Creek hospitality stop, another resting spot mushers can use to break up the 160-mile journey into three runs of relatively similar distances. Trout Creek is located 57 miles from Slaven's, though mushers have to leave the Yukon River to reach it. Those spots seemed to be the favorites among mushers, including Bernhard Schuchert, who has completed the Iditarod Trail Sled Dog race and has run the Finnmarkslopet in Norway 14 times. Although Schuchert, a native of Vallbo, Germany, has 35 years of mushing experience, he was happy to receive some advice about how to make the Circle to Eagle commute a little bit easier. "I'll try to make it to Slaven's and then have another rest at Trout Creek," he said. "That's the recommendation I got at least. We'll see how it works out." Brad Joyal is a reporter for the Fairbanks Daily News-Miner.